Do you want to learn more about edible gardening? Are you a foodie? Do you want organic seeds? This garden catalog, The Cook’s Garden, offers something for everyone. The Cook’s Garden offers European-inspired selection of seeds and custom grown vegetables you can grow in your home garden. The Cook’s Garden now offers custom grown plants that are certified organic to go along with our certified seeds. All vegetable and herb plants are grown under strict organic guidelines and certified by Pennsylvania Organics. The Cook’s Garden certified organic plants are grown using only all-natural methods. Make sure you check out the recipe section, also. Categories: Edibles, Resources, Spring Garden, Summer Garden | Tags: Blooming Gardens by Cindy, Bloomington, Central Illinois, Illinois | Permalink. Garden with Us: What we are doing this week in the gardens…..
Now is the time to rejuvenate your garden for fall enjoyment. If it’s brown, we’re removing it! Use hedge sheers and cut the entire plant back to new growth. If the plant shows no new growth, we leave 1-2 inches of stems for rejuvenation. Make sure you water the plants well so they can recover!! This past week, we had a client contact us for help in his garden. He had removed two large shade trees at the front of his home so a once shady garden has now become a full sun garden. He asked us to design a native plant garden to fit into his landscape. The design will be incorporating the smaller prairie grasses and forbs planted in large drifts. Stay posted for photos. Fall is a great time to establish and plan new gardens. Planting season officially begins in September, but with the cool days, we can start now.We are planting grasses and shrubs in new landscapes. Any planting during August should be done with caution. Keep plants moist and shaded. Categories: Maintenance, News Updates, Resources, Summer Garden | Tags: Blooming Gardens by Cindy, Central Illinois, Cindy Eack, Fall garden clean-up, Garden maintenance | Permalink. Personal gardens often take a bit of rest during the month of August. It is a busy moth for cutting back “tired” plants that have finished blooming and dead-leafing any scorched subjects. Don’t forget to water. We are still in drought. Prune plants to keep in desired space. Aster and mums can be cut back by 4-6 in. to delay bloom, though at the expense of floral abundance. Design beds and order plants for autumn planting. Bearded iris. Oriental poppies and peonies can be divided now. 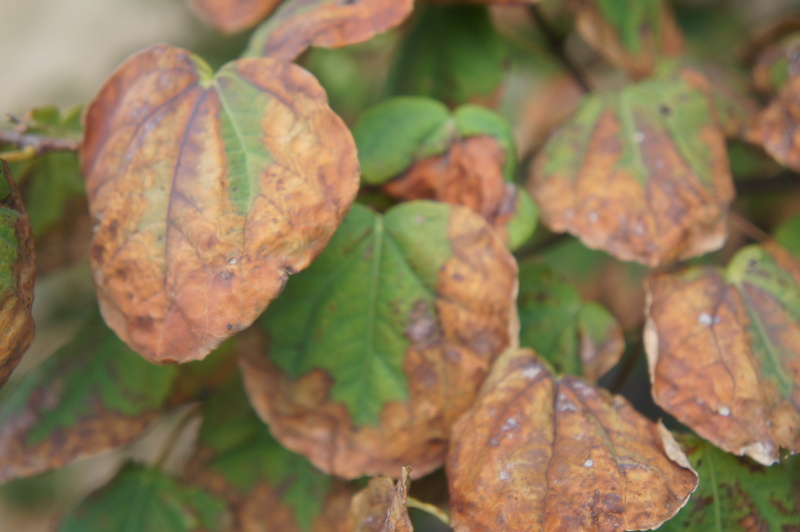 Be wary of adding leaf scorched plant material, unless you are positive the plants had no disease or fungus problems. Add water to pile to keep moist. Categories: DIY, Maintenance, Resources, Summer Garden | Tags: Blooming Gardens by Cindy, Bloomington, Central Illinois, Cindy Eack, composting, garden planting tips, Illinois, pruning tips | Permalink. 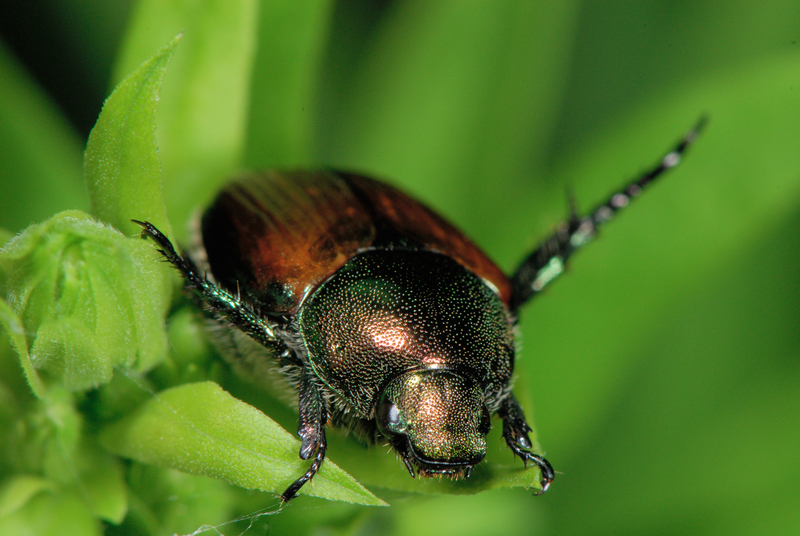 Japanese Beetles–They are back……and they are here to stay!! So what is the best way to control the beetles? It largely depends on your viewpoint. One philosophy is to kill the insect to protect the trees, plants and lawns. There are many commercial products that can help you do this. Unfortunately, a commercial product can’t distinguish a pest from a beneficial insect. I will be writing more about this topic in upcoming blogs. My point is that we have to learn how to live with or manage this insect pest while attempting to minimize its impact on beneficial organisms found in the ecosystem. So for all of you who want to help save your trees, plants and roses– listed below are a few organic tips to control infestation. First, you don’t need to eliminate all beetles to protect your trees, plants or lawn. Ever though the leaves of your plants will look like skeletons many health plants can withstand the damage. Second, to prevent a Japanese Beetle Party starting on your plants…Start early- JB put off a scent that draws more beetle to your plants. The more beetles you have the more you get. Third, hand pick beetles—put in jar with soapy-water or vegetable oil (do this 2 times a day). This should take you no longer than 10 minutes a day depending on the name of plants affected. For future protection, I can help you add a diverse plant selection to avoid food for the Japanese beetle. Categories: Maintenance, News Updates, Summer Garden | Tags: earth-friendly methods, Japanese beetle, organic methods | Permalink.